One of our most popular challenges and one of the toughest at the same time. Climbing the three Highest Peaks in the home nations: Scotland, England and Wales. Starting with Ben Nevis before heading south for Scafell Pike and then finishing at Snowdon. The task is all the more tough as we complete the whole lot in 24 hrs. Now that is going to be challenging! A total of 480 miles of driving, a large part during the night, and climbing a total of almost 3000 vertical metres, makes this a special kind of challenge, and not one that everyone is going to manage. Why not give yourself a goal this year to train for. 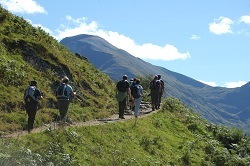 Why not say that you’re going to put yourself to the test, and join the Classic 3 Peaks Challenge. Join a group of like-minded adventurous individuals who will be taking part in this event, looking for a tough weekend, with a few laughs along the way to look back upon! 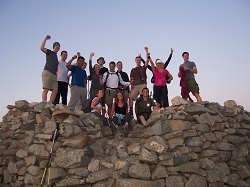 Or why not bring along a complete ready made team from your company, healthclub or charity? The following itinerary is based on running this activity over a long weekend, however it may be possible to alter this. All timings are approximate and can be tailored to your groups needs. Saturday night—our mobile palace on wheels! Or should that be one of the least smooth nights sleep of your life! You may wish to bring a travel pillow - and a good sense of humour! You may also wish to ensure you have sufficient warm clothing - as even in summer it can feel chilly overnight, when you're feeling tired. Sunday night—not included, but accommodation in Chester can be arranged upon request. *All transfers provided by Adventure Cafe's transport provider throughout the challenge from pick up and drop off in Chester on the friday/Sunday. The drivers are regulated by current DVSA drivers hours regulations and enforced driving/rest stops.